Mr. Babatunde Fowler, Chief Executive Officer of the Lagos State Inland Revenue Service and Executive Chairman, Lagos State Board of Internal Revenue, has explained why Nigerians are reluctant to pay taxes. In an interview with newsbreak.ng, Fowler blames the reluctance on Nigerians' lack of trust in the capacity of leaders to use their money prudently. "For a start, you won’t find anybody willing to part with his or her money. The second reason is that Nigerians appear unsure that their money will be spent judiciously. This makes them reluctant to part with their money in the shape of taxes, " he said. The LIRS boss, however, added that this problem has been conquered in Lagos State because Lagosians have seen what their taxes have delivered in terms of development. "They are more encouraged to pay taxes," he disclosed. The LIRS boss also explained that the majority of tax defaulters are high net worth individuals, who are widely travelled and admire the services in the various places they visit, but remain unwilling to pay taxes. The success of Lagos State, for which Fowler is widely lauded, has made the state the model to copy in tax administration." Last year, the IGR was an average of N20.5 billion per month. On the average, we generate almost thrice of what we get in federal allocations. That is not to say we don’t need the allocation from the centre. There is a need to realise that we still have many things undone. There are many expectations yet to be met; a lot of major infrastructural project requirements, which involve transportation, water, health and others. With what we generate, it is not unsafe to say that Lagos can meet its recurrent expenditure," Fowler added. Q: What would you describe as your biggest achievement in the nine years that you have been on the job? Apart from the jump in revenue, it will be the acceptance, by members of the public, of the fact that taxes are required for development. I am convinced that we have succeeded in educating people on the importance of taxes. We have sent young people into the open market, unaccompanied by policemen, and they have faced no harassment from members of the public. Earning the trust of the public is a monumental achievement. There is no country or state that can achieve its objectives of governance without funding. Every leader who has a vision needs funding to achieve his objectives and payment of taxes is the primary source of funds for the government. Taxation is so important that in the parts of the world where it is well embedded in the political eco-system, it plays a major part in politics. The question of whether taxes will be raised or reduced is very important. Even ordinary citizens in those climes have come to understand that government cannot achieve anything if taxes are not paid. I believe that the people of Lagos State have also gotten to the point whereby those paying taxes understand and see what the taxes are doing for them. Lagos State currently receives an average of N8billion from the Federation Account on a monthly basis. Out of this, N6billion is spent on the payment of salaries. If we remove this, Lagos State will be left with only N2billion. This N2billion will not be enough for anything. Just imagine what Lagos will be without these taxes. Look at the recent Ebola outbreak in Lagos and the way the Lagos State Government dealt with it. Imagine a Lagos State without the financial might to curtail the virus. So, every government needs funds through taxes. If you say that Nigeria has oil, remember that Africa has the most resources yet it is the poorest continent. Between June and July this year, oil receipts dipped by about 19% and this immediately affected revenue allocations to states. So, the only way to sustain development is to depend on taxation, which the government can plan with. Q: To what will you ascribe people’s unwillingness to pay taxes? For a start, you won’t find anybody willing to part with his or her money. The second reason is that Nigerians appear unsure that their money will be spent judiciously. This makes them reluctant to part with their money in the shape of taxes. But Lagos has proved an exception. Lagosians have since seen what their taxes have delivered in terms of development and are more encouraged to pay taxes. Q: Lagos is held up as a model in tax administration. In specific terms, how much does Lagos generate monthly? The Commissioner of Finance has the audited figures. But for last year, the IGR was an average of N20.5 billion per month. On the average, we generate almost thrice of what we get in federal allocations. That is not to say we don’t need the allocation from the centre. There is a need to realise that we still have many things undone. There are many expectations yet to be met; a lot of major infrastructural project requirements, which involve transportation, water, health and others. With what we generate, it is not unsafe to say that Lagos can meet its recurrent expenditure. Q: A major problem in tax administration is how to capture those in the hidden economy. How successful have you been in bring commercial motorcyclists, tailors, hairdressers and other artisans into the tax net? I am sure you’d be surprised if I say members of the category you just spoke about actually pay their taxes. They do. The ones who give us the biggest problems are the high net worth individuals in the in formal sector. These are professionals who work for themselves, own cars but don’t pay taxes. We are talking about engineers, architects and doctors. They are people who may have travelled abroad and admired the kind of services that the government over there provides, but are unwilling to pay taxes. Over the last two or three years, we have had occasions during which we apprehended about 10, 000 car owners. Those apprehended had never paid one kobo in tax. But now, if your car is seized, you’d have to be checked for tax payment before it is released. These are the people who give us the biggest headache. Last year, the governor met with such professionals and appealed to them to pay their taxes. Q: How have you been dealing with this category of people? Apart from the appeal made by the governor, he added that the state also has the power of prosecution and we have started to prosecute such individuals. Q: Complaints about multiple taxes remain rife, with claims that there are about 20 different tax bills. Is this situation not stifling businesses? This is not correct. The tax issues in Nigeria are federal laws. First and foremost, all states have the same taxes and have the same rates that are passed and approved by the National Assembly. A state is empowered to introduce new taxes and levies. I can tell you clearly that there is no multiple taxation in Lagos State. What some people call multiple taxes are user charges. Some of these so-called taxes are charges for the use of services. Multiple taxation is when you pay the same taxes to more than one arm of government. We don’t do so in Lagos State. Q: There is this long-running debate about Lagos State is heavily indebted to Ogun State as a result tax collection from people that work in Lagos State, but reside in Ogun State. It is not true that we are heavily indebted. The two governors have met. If you notice when you are driving in Lagos, at certain points and in certain areas, you will find yourself in Ogun State. The two governors came together and looked at the boundaries between the two states. These boundaries have been clearly defined. And in accordance with tax laws, you pay taxes where you reside. It means that for all those who work with the Lagos State government, for example, but reside in Ogun State, their taxes are being sent to Ogun State. We have a very good working relationship and there are no hiccups. Q: How much has been paid to Ogun State in arrears and how much remains yet unpaid? Since the discussions started, all payments due to Ogun State have been made. In terms of arrears, the Ogun State government then did not enforce its tax administration in the past and the current governors have decided to correct past mistakes and start on a clean slate. Things are working well now. Q: There was a time the Federal Executive Council directed that state governments should stop using consultants for the collections of taxes. Has Lagos complied with this? What we learnt was that some organisations and individuals are collecting money on behalf of certain states and local councils. The law, unambiguously, states that only the board of internal revenue is mandated to collect taxes in terms of cash. This, however, does not suggest that a state cannot use consultants to gather data. The law only says that consultants cannot do assessment. This means they cannot determine how much is due in terms of taxes, which is a function of the board of internal revenue. That has been the case in Lagos State for a number of years. Also, our policy is that all taxes or payments to the state government are made directly to designated banks. The government used to allow collection of N2, 000 and below by staff, but we have a policy under which staff are not allowed to collect any cheque or cash-irrespective of the amount. Any staff that goes against this will be dismissed. Q: How much of a leap in IGR can we expect in Lagos and what targets have you set? I am not the type to put a figure on such things. What we aim to do is to get 99.9% of Lagos residents to pay their taxes. Q: What drives you to do a job that not many would relish? My motivation is the transformation of Lagos. Everyday that I drive through Lagos, I feel glad seeing the changes in the state and the joy that this development brings to our people. We have a visionary governor. But it is a fact that without the money to implement the vision, it will remain a mirage. We need to commend the tax payers because they could make our job considerably more difficult. If we look back and compare we were and where we now are, we can see an enormous difference. Q. To what will you ascribe the success of the Lagos State Internal Revenue Service over the years? I will first of all give appreciation to the two governors I have served under. First, it was His Excellency Bola Ahmed Tinubu who, perhaps, as an accountant and a money manager, understood that with money coming in from the federation account, there was no way he could achieve his vision for Lagos State without the funding that comes with good tax administration and he gave us one hundred support. And the current governor, His Excellency Babatunde Fashola, has also done the same. At certain functions, when he is making jokes, he asks people who make comments whether they have paid their taxes. Because, as he continues to say, without tax revenues, Lagos cannot perform. Lagos is one of the few states that can be said to be working. In 1999, the internally generated revenue averaged about N600 million per month. The budget size was about N17billion per annum. Last year, it was N500bn and this is because the IGR has increased to the point that we can get loans from the World Bank and other agencies, which see that we are able to pay. What makes tax Administration In Lagos State special? 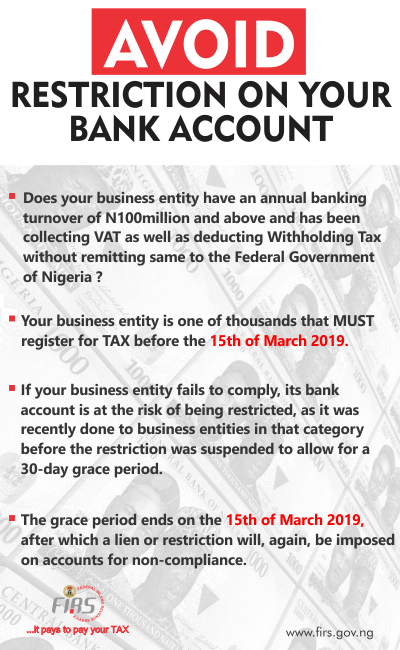 The transparency; the way we do business in Lagos. Our staff don’t touch cash. All taxes are paid straight into state coffers. We don’t, as a revenue generating organ, have access to the monies we collect. We depend on subventions like other government agencies. The people of Lagos State also see the benefits of the taxes collected. They see how the government is spending their money. All of these help us and make our job easier.